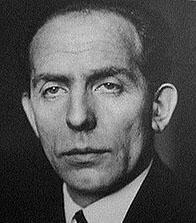 Mike Reisch suggests, Friday, March 4, 2005, that judges and prosecutors in the current wave of hate-trials against revisionists should be awarded a plaque in memory of the Nazi hanging judge Roland Freisler. I SUGGEST revisionists set up the Roland Freisler (right) Award for Judicial Excellence. It could be handed out annually to prominent Judges and Staatsanwälte involved in high profile revisionist persecution trials. Canada's now famous Judge Pierre Blais, as well as Germany's public prosecutor Hans Heiko Klein would be outstanding nominees. AN excellent idea; I will ask an artist to design a plaque. At current rates, we may need to award more than one "Roland" per year.